Simple drill this week: 2v2 below the goal line. Coach stands in the crease with pucks. Players not involved stand along the goal line and create a human barrier – trying to create a tight area space. Nets are placed snugly against the boards before the corner. Players engage in a 2v2 battle below the goal line for 30-50 seconds. 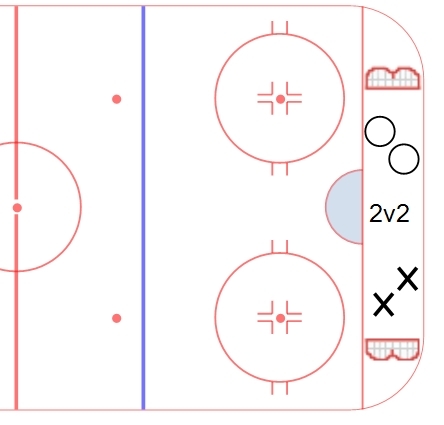 This drill works on battles, puck strength and creativity. In tight area games, players need to be heavy on their edges, have strong sticks and use their bodies to protect the puck. Players also need to have a creativity level to understand the angles and spacing in a tight area to create scoring opportunities. A good drill for players to work on tight area puck skill.